Look, let’s be honest - there are a lot of different feelings out there when it comes to clowns. Some people love ‘em, some people hate ‘em, and some people pretend to be scared of them just so they can get out of going to the circus or local parades with their nieces and nephews. 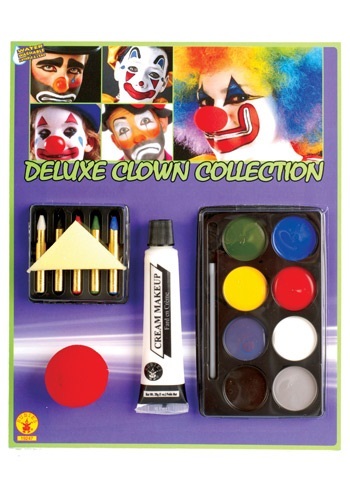 But how people feel about clowns is actually all up to you when you’ve got this Clown Makeup Set! Think about it! The red nose included in the set is the basic premise of any clown face, but with one pinch of that sponge applicator, the power is yours! You can use the white base, eight color makeup tray, and 5 highlight sticks to transform into either a lovable clown who breaks through old stereotypes, or a creepster buffoon who confirms everyone's worst nightmares! The makeup also washes off easily, so you don't even have to stick to one look for the rest of your life...or even during the whole day! Think about the possibilities - you can be a funny, kid-party-friendly balloon artist by day, and then transform yourself into a haunting park lurker by night! So don't let those pesky public opinions of your profession hem you in, Bobo - set your artistry free and express your clown self with this Clown Makeup Set! Exaclty as described. Excellent price. worked as well as the geisha girl makeup kit. It didn't!!! buy, spend the extra and buy the professional stuff.